• Roadway improvements resulting in consistent four through lanes (two northbound and two southbound). • Bike lanes on both sides of the street. 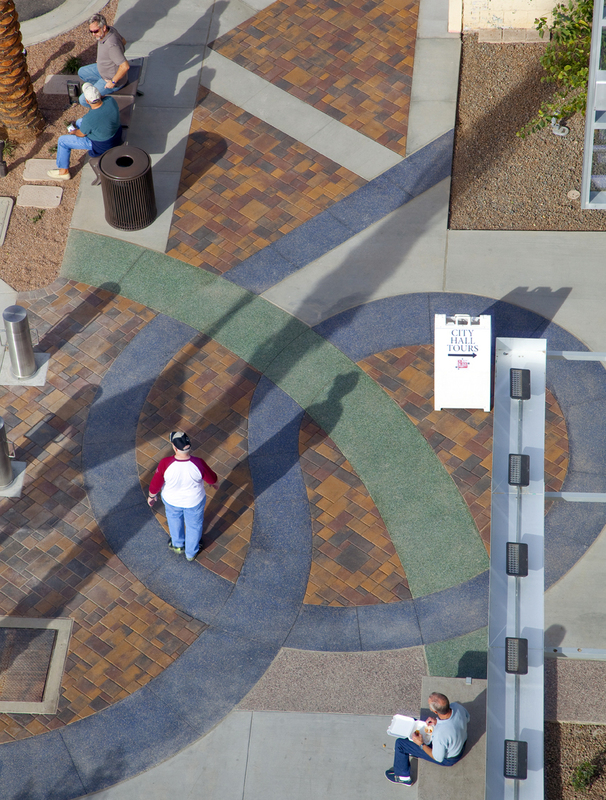 Brick paver and lighted mid-block crosswalks. • Storm drain improvements, new curb and gutter. • Enhancement of the existing median between Boston Street and Chandler Boulevard and construction of flush medians at the intersections exclusively to accommodate left turns. 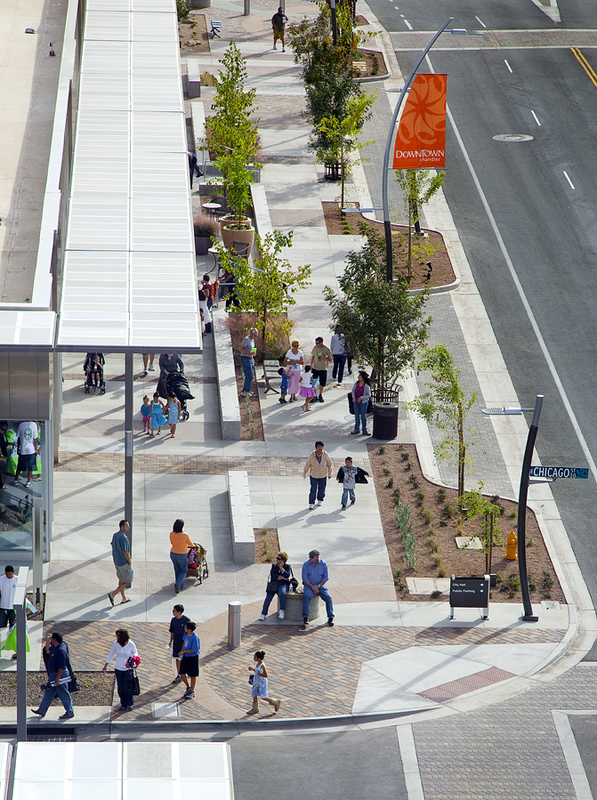 • Additional on-street parallel parking from the original 23 spaces to 81 spaces. • Concrete seatwalls inlaid with polished glass and local artists’ tile work. Concrete art pads with LED uplights. 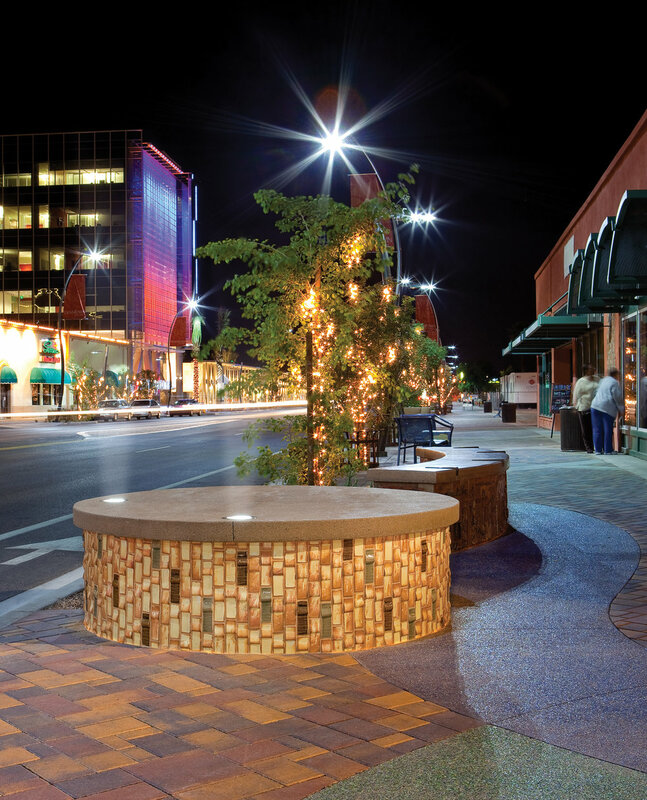 • Concrete pedestrian hardscape with significant embellishment of varying colors of crushed glass “ribbons” throughout to draw attention to focal points. 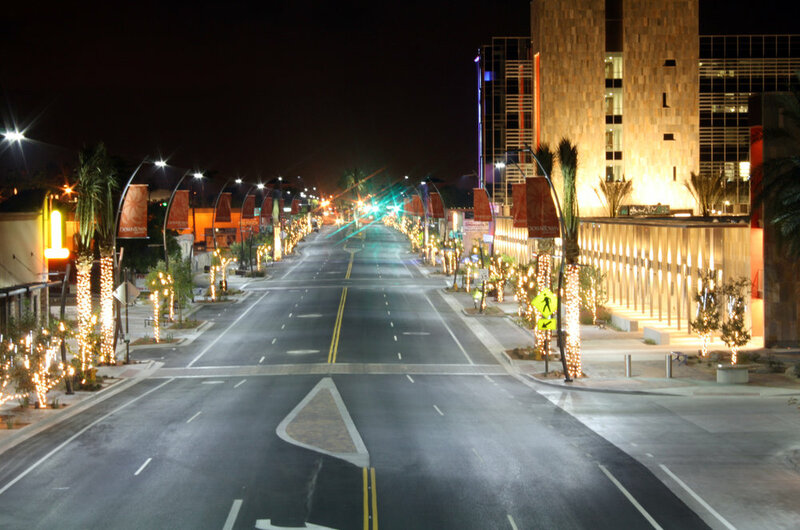 • New street/pedestrian light poles with curvilinear design which accommodate LED lighting and banners. • Custom, artistic park fencing at A.J. Chandler Park. Street and wayfinding signage. • Concrete pads with electrical and data provisions for future monument signage. 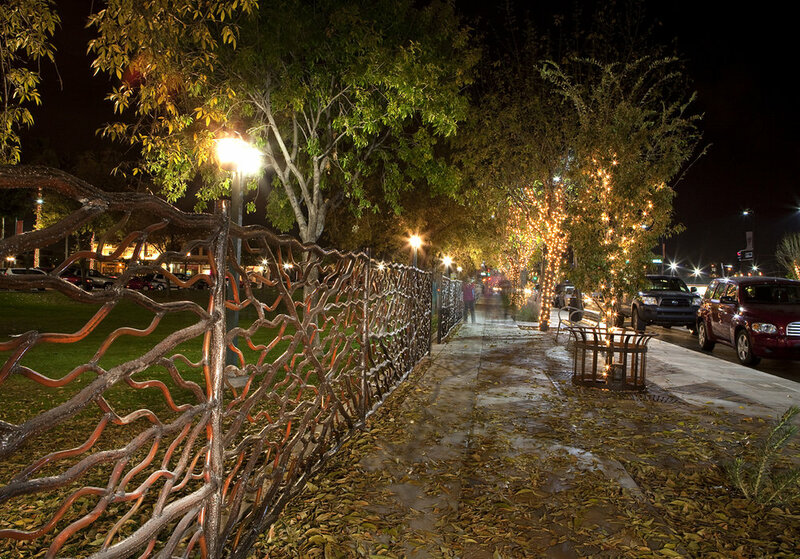 • New landscape and irrigation, preservation of historic trees and landscaping, and accompanying LED accent lighting. • Site furnishings to include chairs, bistro tables, benches, bike racks, and trash receptacles. • APS electrical modifications, upgrades and improvements. Traffic signal modifications. • Electrical upgrades to accommodate vendor needs for the many regular events hosted in AJ Chandler Park. 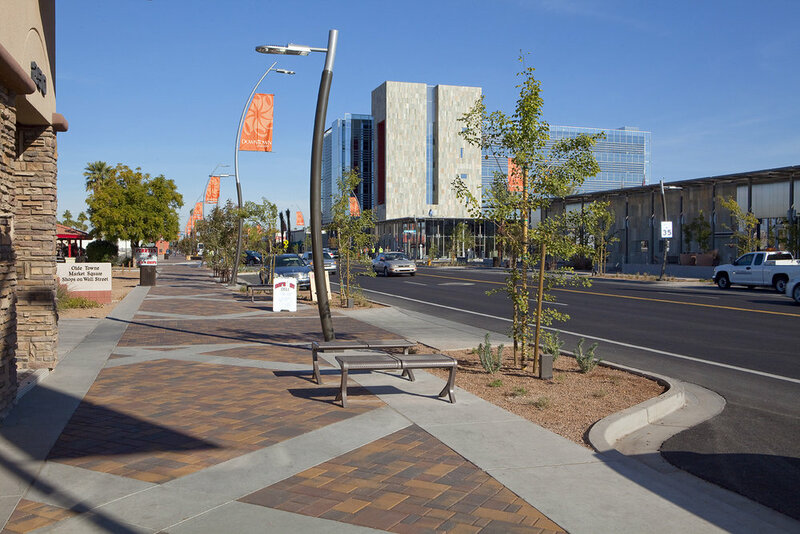 • “Constructing for the future” by installing utility upgrades, additional underground conduit and crossings, as well as plumbing for a possible future signalized intersection, based on the City’s planned future development and desire to preclude disruption of this beautiful streetscape.